During the winter months in South West France there are plenty of blette (or Swiss chard) celeriac and potato. 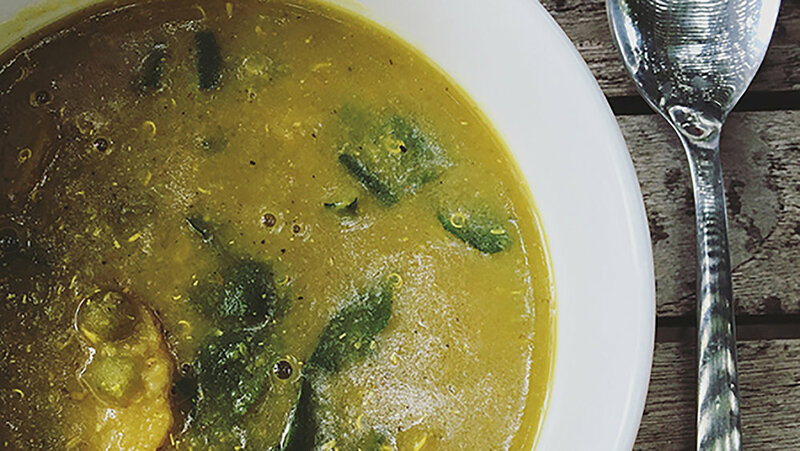 This seasonal soup makes not only a wholesome, healthy, and tasty meal, but it also offers many health benefits too. The herbs and spices have healing and medicinal qualities to help protect against colds and flu during the winter months and the addition of spilt peas provides extra substance. Split peas are high in fibre, good for lowering cholesterol levels and reducing IBS. Swiss chard has a high nutritional value. It is an anti-inflammatory, packed full of antioxidants and helps to regulate the body’s blood sugar levels. If you cannot find Swiss chard, kale is a worthy substitute. Turmeric and Fennel seeds share similar qualities, both acting as an antiseptic, anti-inflammatory and aiding digestion. Chilli also has anti-bacterial qualities and adds a little fire to the system, at a time of year when the body is sluggish. Wash green split peas well before soaking in boiled water for 1hr. After 45mins of the split peas soaking start to prepare the vegetables. Wash vegetables and chop chard into 1 cm strips and cut *potato into small cubes. Then peel, dice and chop the celeriac and onion into small pieces and keep separate from the chard and potato. In a medium sized saucepan, place the potato, split peas and vegetable stock. Bring to the boil and then keep on medium heat simmering for 20 minutes whilst you make the Baghaar. A Baghaar is a traditional Indian technique of dropping spices into hot oil, which transforms them giving them a new concentrated flavour.